Each hotel in Punta Cana features stores where local arts and crafts can be purchased and vendors and artisans bringing their creations directly to the tourists. Punta Cana is in a way tourist trap so don’t expect any great deals here. Punta Cana has two main shopping plazas (Plaza Bavaro and Plaza Punta Cana), stocked with Dominican & Caribbean crafts and unique gift ideas: silver and hand made souvenirs, hand-rolled cigars, rum and ceramics. Shopping plazas in Punta Cana are in the open air and consist of many small shops. There’s another shopping complex, mainly for crafts, reached along a dirt road labeled MERCADO. This is a bustling crafts market open daily 8am till sunset..
One of the more recomandable shops is La Reina Dominicana located at the Plaza Brizas de Bavaro. They sell handmade cigars, Dominican Amber and Larimar jewelry, organic Dominican coffee and Dominican rum. Shopping at Plaza Bavaro provides a great opportunity to mingle with the locals while on vacation in Punta Cana. 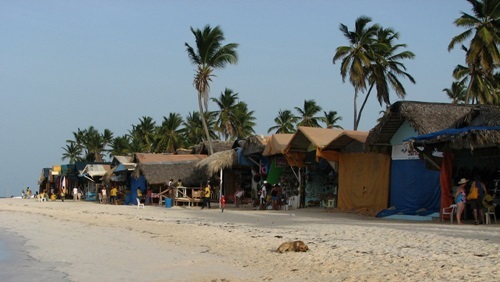 Plaza Bavaro is the favourite shopping plaza for visitors and locals alike. The Plaza is open every day from 9:00 am to 7:00 pm and includes many gifts shops, a calling center, Internet center, banks, restaurants, pharmacy, jewellery store and various boutiques. It is an ok place to bargain hunt, especially for cash purchases – don’t forget to ask for a discount, which may be as high as 40% off the asking price. Located just across the street from Plaza Bavaro, Plaza Punta Cana offers a huge variety of merchandise – hand-rolled cigars, local souvenirs, rum, T-shirts and various local crafts.